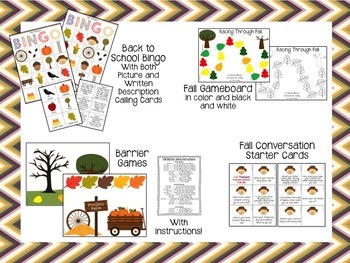 Use the Bingo Picture Cards and match them to the Description Cards to target fall themed vocabulary words! Students should sit around a table with a barrier between them. (books, file folders, or binders work as barriers). Every player should have the same background and items. The players take turns giving the other players specific directions on how to arrange the materials in front of them. The goal of the game is to have all the players’ materials look the same at the end of the activity. 1 in black and white; 1 in color. You can use the black and white one as a do-a-dot if preferred. Great reinforcers for any goal! 10 scarecrow cards with fun questions to discuss fall! Roll-a-Word (2): Write four articulation words in the boxes at the top. Have your students roll a die and cross them off as they say each word. Fill the Tree: A cut and glue activity that is perfect for articulation practice & homework. Write a word on each apple/leaf beforehand. Favorite Fall Things: Two worksheets (one with only drawing) for your students to write/draw their favorite fall things. My Fall Weekend: A fun worksheet for your students to sequence, draw, and write about their fall weekend. 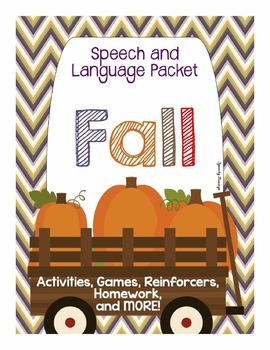 Color the Fall Scene: 4 receptive language worksheets with directions. Bubble Chart Describing: Fill in each bubble with a descriptor of different fall items (e.g. leaf, acorn, pumpkin, tree, apple). Contains 5 books with a fall theme. Print and send home as ideas for the home, or use in your speech room! Two-Step: Also known as first, then. Would be good for simple cause/effect as well. Have your students use the sorting mat to arrange the two events in order. There are labels on the side to keep your cards organized. There are 1 3-step, 1 4-step, and one 6-step. Each of these larger sequencing can be broken into smaller sequences (2-6) easily so you can customize them based on each student’s level. Use the included number cards to have your students match the order. 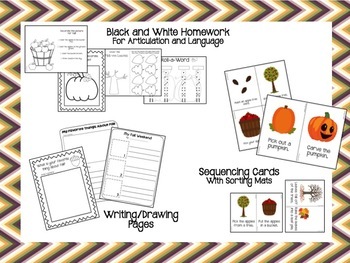 Arrange the cards on the included mat to form fun fall themed sentences. Challenge your students to solve these social scenarios. Have them answer the questions on the bottom of the card after reading the scenario. Includes a blank page of people, and a blank card on every page for customization. 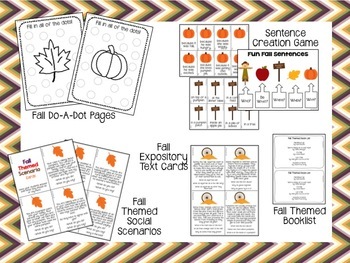 Incorporate fun fall facts with these comprehension cards. At the bottom of each card is a couple comprehension questions to assess your student’s comprehension of the passage! If you have any questions about this product, email me at speechymusings@gmail.com! For information on giveaways, freebies, and sales, click here to 'like' me on Facebook! For more speech therapy ideas, click here to see my blog.